Carmichael business people posed with awards at Best of Carmichael Celebrations. 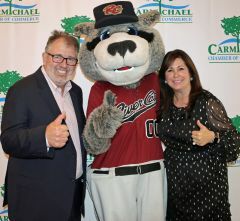 A surprise guest, River Cats mascot Dinger posed with dentist Kevin Tanner and Chamber of Commerce President Gabrielle Rasi. 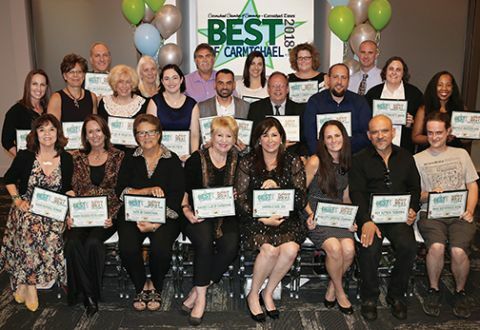 CARMICHAEL, CA (MPG) - Business folk were toast of the town when the Carmichael Chamber of Commerce and Carmichael Times hosted a “Best of Carmichael” awards gala last week. Winners were decided by online vote and received proclamations from Congressman Ami Bera, Senator Jim Nielson, Assemblyman Ken Cooley and Sacramento County Supervisor Susan Peters. Thirty-one contested categories included professional services, supermarkets, restaurants, fitness centers, non-profits – and dozens more entities that make Carmichael a business and residential hub. Dominating winners, the Carmichael Kiwanis Club took dual awards for best service group and for hosting the popular Taste of Carmichael Event. Rey Azteca Taqueria gained distinction as best restaurant and the River City Brewery took kudos for preferred pub. Ancil Hoffman Park was this year voted tops for recreation and the La Sierra Center (Carmichael Park District) scored as best community facility. The best grocery store award went to Bel Air #511. 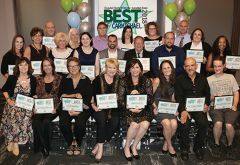 Best Automotive Service – American Eagle Auto Body – took an additional award as the business that won the most votes overall. Now in its second year, the competition has gathered steam; 600 more voters than in 2017 participated and 150 guests enjoyed the celebration gala. 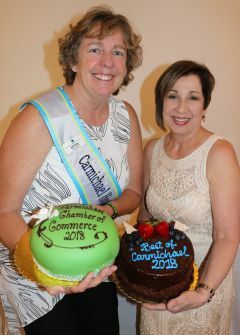 A fundraiser for the Chamber of Commerce, the event included a dessert auction with tempting treats bespoke from local bakeries and restaurants. In the Milagro Centre’s ballroom, Carmichael’s business community ate, drank and was exceedingly merry. Best Restaurant – Rey Azteca Taqueria Restaurant. Best Fast Food – Roxie’s Deli & BBQ. 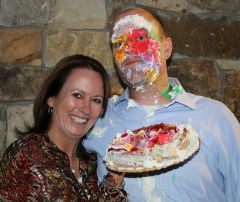 Best Pizza Restaurant – Mark & Monica’s Pizza. Best Coffee Shop – Starbuck’s Manzanita. Best Pub/Bar – River City Brewing Company. Best Yogurt Shop – Crazy 4 Yogurt. Best Grocery Store/Market – Bel Air #511 Carmichael. Best Community Center – La Sierra Community Center. Best Recreation/Entertainment – Ancil Hoffman Park. Best School – Options for Youth. Best Dental Office – Gabrielle Rasi, DDS. Best Medical Doctor – Camellia Women’s Health. Best Hospital – Mercy San Juan Medical Center. Best Pet Services/Store – All Stage Canine Development, Inc.
Best Senior Living – Oakmont of Carmichael. Best Veterinarian – Blue Cross Pet Hospital. Best Salon/Beauty – Portfolio Image Skin Care. Best Bridal Shop – Bride to Be Couture. Best Automotive Service – American Eagle Auto Body. Best Health/Fitness Spot – California Family Fitness. Best Real Estate Office/Realtor – Coldwell Banker – Craig Diez. Best Bank/Credit Union – Golden 1 Credit Union. Best Accounting & Tax Service – Biegler CPA, Inc.
Best Photographer – Susan Maxwell Skinner. Best Lawyer/Legal Service – MacFarlane Legal, Inc.
Best Insurance Service – Farmers Insurance – Katie Pexa Insurance Agency. Lind Brothers Funeral Home & Crematory. Best Resident/Commercial Contractor – E.S.L. Construction. Best Service Club/Community Club – Kiwanis Club of Carmichael. Best Church – Our Lady of Assumption. Best Event of the Year – Taste of Carmichael. Event sponsors included Advanced Home Health & Hospice & Affiliates; the Milagro Centre; SMUD; Trillium Real Estate; Arden Hills Resort; Atria Carmichael Oaks, Carmichael Times; Dignity Health Mercy San Juan Medical Center; Western Health Advantage; Armor Mimi Storage; Dr Gabrielle Rasi DDS; Battery Bill; Christ Community Church; Eskaton Village Carmichael; Farmers Insurance Kate Pexa Agency.